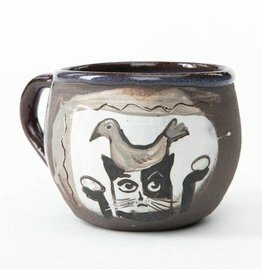 Hand painted mug features a cat with a bird seated on it's head. The cat's "arms" are held up at shoulder height, and the cat holds an egg in each hand. 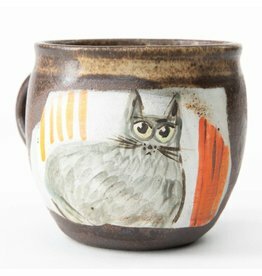 Hand painted mug features a gray cat staring at the observer with an orange curtain hanging to the left.